The IOGEAR GVS78 is an 8-port VGA video splitter and a signal booster with IOGEAR's patented VSE (Video Signal Enhancement) Technology. It is the best choice for splitting and carrying a video signal to more that one display with the same quality as the original signal. 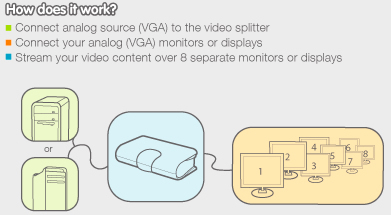 The GVS78 VGA Video Splitter is used to take video input from a single source and direct it to eight video outputs for monitors using analog signals. The signal boost obtained by using IOGEAR's patented VSE (Video Signal Enhancement) Technology allows you to not only split the signal but it also amplifies the video signal to increase the transmission distance to about 215 feet away. This is no small feat, your average VGA card, over a standard VGA cable, sends a clear VGA signal approximately 25 feet. Operating with a bandwidth of 300MHz (300 million cycles per second) that is 50 times greater than a simple TV signal. The high bandwidth allows for the transmission of large amounts of information at a very high rate of speed, thus allowing for the use of high resolution settings upwards of 1920 x 1440 in 24- or 32-bit true color mode. Amplifies video signals increasing transmission distance up to 215 ft.
Answer: Thank you for your inquiry. This device requires VGA cables to operate.